The invigorating fragrance and hot taste of yuzu kosho will keep you coming back for seconds! Simply steam-bake, deep fry, or boil and enjoy. This item contains no garlic. Product totals 270g (15 pieces, 18g each). The filling of these gyoza includes yuzu kosho from Kyushu. Yuzu kosho is a seasoning made from pepper, yuzu (a type of citrus fruit) peel, and other ingredients. Their filling also includes rough-cut cabbage, and has a pleasantly crunchy texture. These gyoza are excellent by themselves or paired with sake. Dumplings such as these make great snacks, appetizers, or side dishes, paired either with other traditional-style dishes or with modern fare. 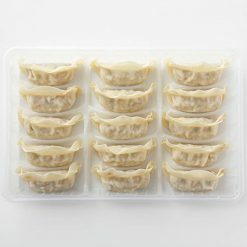 Making gyoza from scratch at home can be frustrating as well as prohibitively time-consuming, but Sugarlady’s frozen gyoza can be ready to eat in mere minutes; with very little prep or cleanup to worry about! Our goal is to make it easier for you to serve your favorite foods anytime, even on your busiest days. Distribute 1 tablespoon of oil in a heated frying pan, then add the gyoza (still frozen) (if using a fluorine resin pan, no oil is necessary). Add enough water (80 to 120ml) to submerge the bottoms of the gyoza, cover with a lid and steam-bake on medium heat for about 5 minutes. Just before the water has all evaporated, lower the heat a little and add 1 teaspoon of oil. Distribute the oil evenly throughout the pan. Fry for about 2 minutes. 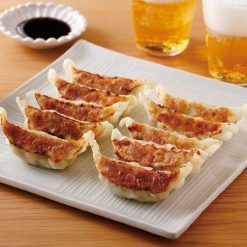 When the bottoms of the gyoza look pan-fried, they are done.These gyoza can also be deep fried or boiled.Notes: Frozen gyoza may break easily, so please remove from package with care. Hot oil may jump from the pan, so please use caution to avoid burns. Please adjust quantities of oil and water and lengths of cooking time according to the number of gyoza being cooked and your frying pan’s size and efficiency. This product contains vegetables (cabbage, onions, garlic chives, ginger), meat (pork, chicken), pig fat, yuzu kosho, granulated soy protein, potato starch, soy sauce, oyster extract, sesame oil, sugar, yeast extract, table salt, wrappers (wheat flour, rapeseed oil, table salt).. This product is not suitable for anyone with allergies to wheat, soy, chicken, pork or sesame. Origin of ingredients: cabbage/chicken/pork (domestic). Prepared and packaged in Japan.